It’s the final day of the world’s biggest fighting game tournament. 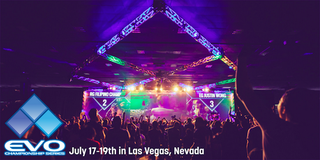 Here’s your source for all things EVO 2015. There’s nothing much going on on the additional streaming channels on this final day of EVO 2015, but there’s plenty of archived footage to sift through. You can watch the CAPCOMFIGHTERS stream here. You can watch the SRKEVO2 stream here. You can watch the SRKEVO3 stream here. You can watch the SRKEVO4 stream here. You can watch the SRKEVO5 stream here. You can watch the SRKEVO6 stream here. And you can watch the SRKEVO7 stream here.